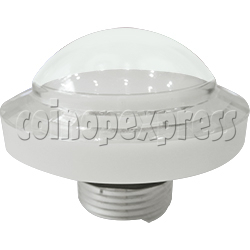 54mm Round Illuminated Push Button -White Color Body with Diamond Cut is in single white color design and also comes with inner white color top. It features in screw in design, durable plastic construction, high quality microswitch mounted into, withstand 10,000,000 operations at least. This illuminated push button comes with 12V LED light, available to display Blue, green, red, yellow and white colors light. Generally used as shooting button on most fish hunter game machine, large-scale cabinet and other amusement machine.